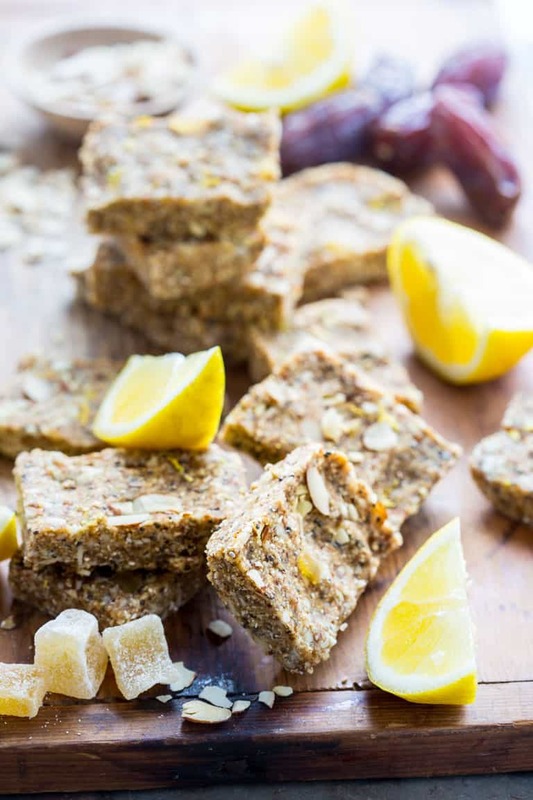 Lemon, almonds, chia and crystallized ginger come together in these simple no-bake snack bars. They are naturally sweetened with Medjool dates and honey. They keep in the refrigerator for a week so you’ll be able to make a batch for a week’s worth of snacks! 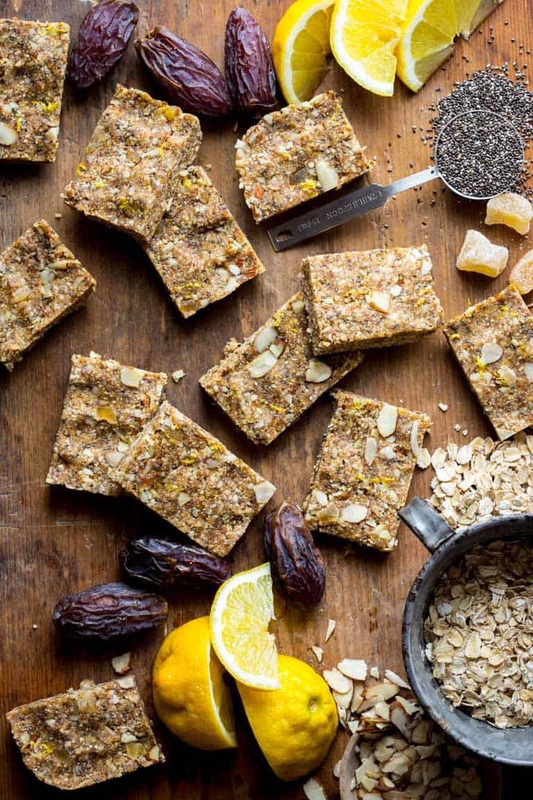 The key to these snack bars is the kind of dates you use. They are the glue that hold them together, and they act as a natural sweetener. Make sure you use Medjool dates which are really soft and sticky, and just perfect to use as the base of these bars. They are so sweet that I only ended up adding a few tablespoons of honey to make the bars come together like a granola bar. The kind of dates you buy in a box that are pre chopped and coated in sugar are too hard and dry to achieve the right texture. You can find Medjool dates in the produce section of large supermarkets. Most often they are refrigerated and in Plexiglas bins with a set of tongs. Some specialty stores and health food stores that have a refrigerated nut and seed section, will have the dates in that section. Store the dates in your refrigerator and use within a month of purchase so they do not harden. To prepare, if they have them, remove the paper-like cap on the stem end, then cut the dates lengthwise to expose the long pit in the center. Remove the pit. Then just roughly chop into thirds or so for this recipe. They will stick to the knife! Chia seeds are a super food! They were eaten by the Aztecs and are now available everywhere. Look for them in natural foods stores with other seeds such as flax seeds. Once the package is opened, keep refrigerated. Chia seeds have Omega-3 fatty acids, protein and fiber. They swell as they absorb moisture, so they also help to keep you full and satisfied. In these bars they help the texture of the bars as they sit in the fridge. As the chia pulls moisture from the dates and honey, the bars become dryer, but they do not harden. I used chopped crystallized ginger. If you can find it, the crystallized ginger that comes in large chunks, and can easily be chopped is best. I like this crystallized ginger a lot because it is very soft and organic. I also used fresh lemon zest. That adds lemon flavor without compromising the texture by adding too much liquid. I recommend buying organic lemons, especially when you zest them. This is the microplane zester I use. It is only $13 and I use it every day! I also used a little of the lemon juice to balance the sweetness. 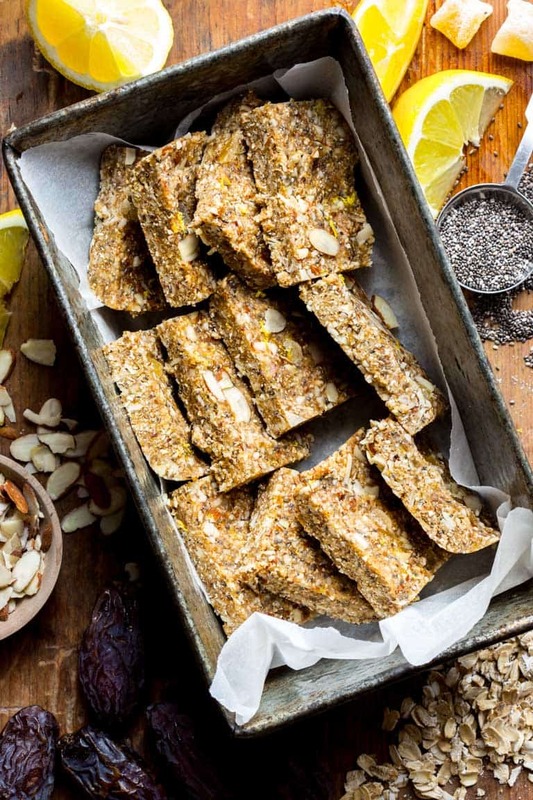 Please let me know if you try these bars, and if you do come back and let us know how you liked them, rate the recipe or tag Healthy Seasonal Recipes on social media. 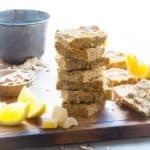 If you’er looking for more portable snacks, try these No Bake Bites too! 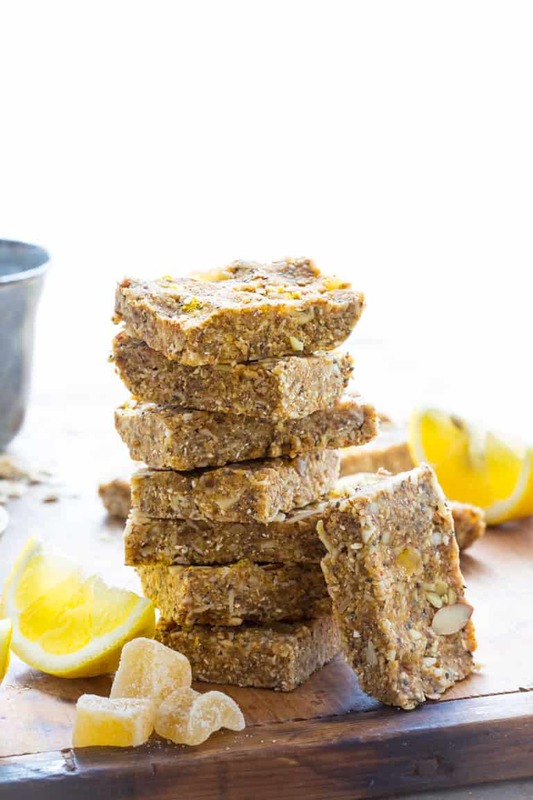 Lemon, almonds, chia and crystallized ginger come together in these simple no-bake snack bars. They are naturally sweetened with Medjool dates and honey, ready in just 15 minutes and have a gluten free version! Grind oats in food processor until flour like in texture. Add chia seeds and pulse to combine. Empty oat mixture into a medium bowl. Grind dates in food processor, scraping sides until paste like. Add honey, lemon zest and lemon juice, and process, scraping sides several times to combine the mixture. Add the oat mixture and process, stopping and scraping until the mixture comes together. Add almonds and ginger and pulse several times to incorporate. 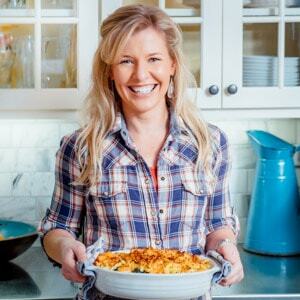 Spray a 8 by 8-inch baking pan with cooking spray. Scrape the oat date mixture into the pan, and press into the pan with moistened fingertips. Refrigerate to firm, 1 to 12 hours. Cut into 12 bars. Store bars in a Ziploc bag in the refrigerator up to one week. 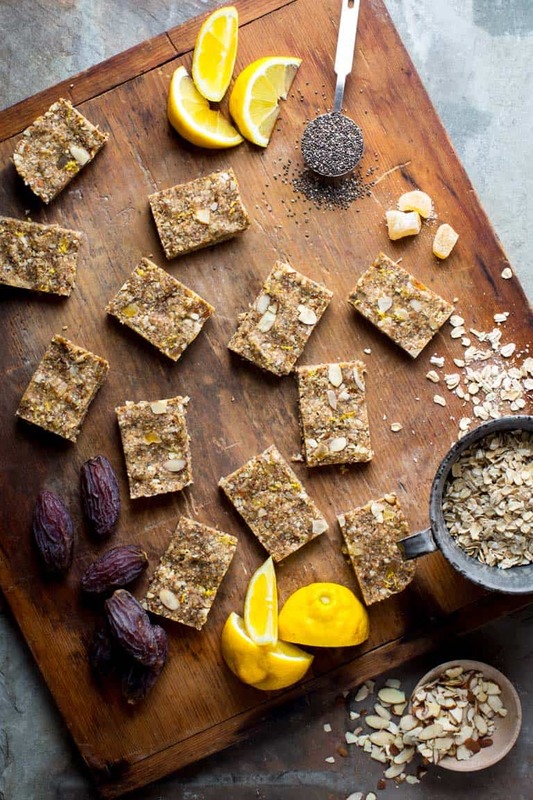 These snack bars look incredible! I love, love, love Medjool dates and I *may* sometimes eat crystallized ginger as a snack. 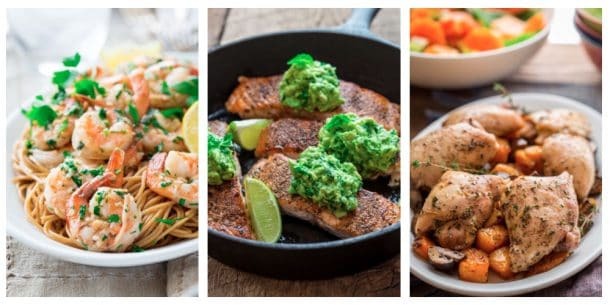 😉 Can’t wait to make these soon! Thank you Sarah. My daughters were begging me for the ginger, and I had to tell them no they were for a recipe. I had two pieces left over and they scrambled for them! Ha ha. 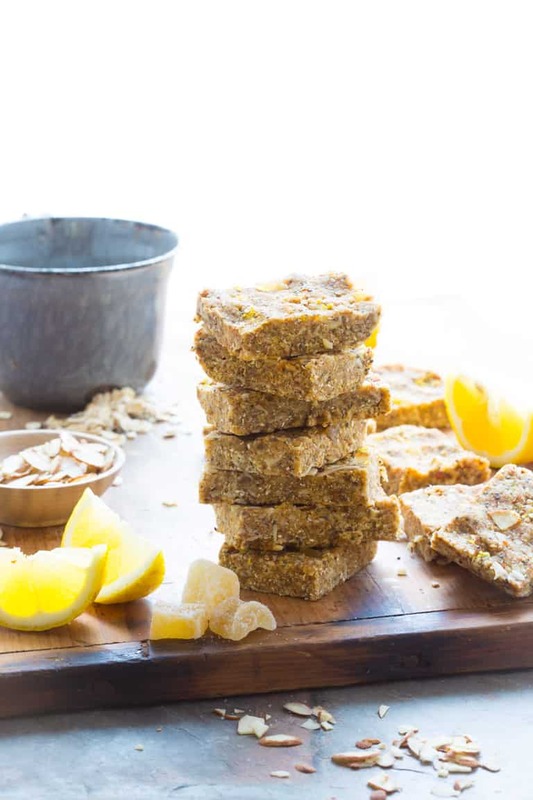 You’ve totally inspired me to start using Medjool dates – these bars look fantastic! Thank you so much Kelly! They are my favorites. Oh I love everything about these snack bars! Wish I had some right now! 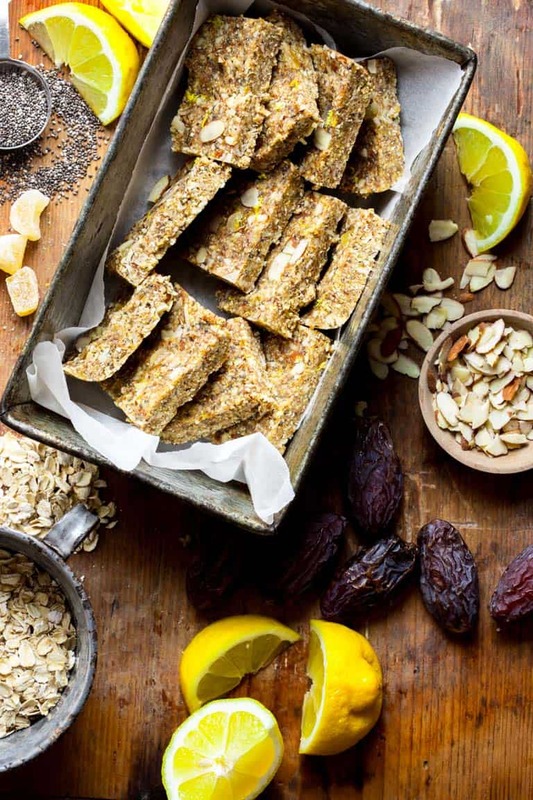 This snack bars looks delicious!!! Can wait I will try them soon. Can be a nice breakfast to start full of energy.